Dogtime’s Road to Rescue program salutes Big Apple Bullies, New York’s “bully breed” advocacy group. How did your organization get started? 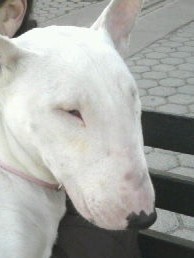 We find good homes for Bull Terriers (also referred to as English Bull Terriers) who have been abandoned or surrendered. Our search for homes is usually, but not strictly limited to, the New York City area. We also want to prevent Bull Terriers from becoming “rescues” in the first place. To that end, we provide educational materials, health and behavioral information and referrals and, on occasion, financial assistance to keep Bull Terriers in their homes. How do most of your animals find their way to you? As a New Hope Program partner, we pull and place dogs from New York City Animal Care and Control. We also work with other area shelters and accept owner surrenders. What happens to the animals once they are in your care? Our Bull Terriers are vet checked and then placed into foster homes where they are evaluated for temperament and health issues before being re-homed. Tell us about a particularly compelling animal or inspiring rescue. Each rescue is inspiring. Although some dogs come to us having been abused or neglected, their stories are no more heartbreaking than the older dogs who are suddenly dumped at the shelter by families who owned them for years, or healthy young strays found wandering the streets. In most cases, we don’t know why or how the dogs have been abandoned or given up, but in each and every case, finding that Bull Terrier a new loving home is fulfilling beyond words.